It may not take a village to raise a child anymore, but parents and teachers certainly continue to play a vital role in the growth of the child. Hitherto, the parents’ and teachers’ groups were largely disjoint with brief overlaps coinciding with “PTA” meetings where a five minute face-to-face was expected to exchange a semester-worth of information. With familial focus shifting from multi-children households to largely nuclear families with limited offspring, parents and teachers have come to expect more from their interactions with regard to their wards. Both sets of caregivers rightly believe now that teacher-parent communication fosters better understanding and collaboration between the classroom and home to make education a wholesome experience for the child. Indeed, research has shown that increased parent participation is a critical influence on student success. Despite the known benefits of increasing parent participation in schooling, parent-teacher conferences can be stressful for teachers, especially in a competitive society that often breeds helicopter parenting and tiger parents. But beyond interpersonal strain that such meets can cause, the sheer volume of information that must be sorted and communicated can make such meets less than pleasant for the teacher. Through experience, teachers learn the best way to deal with the stressful experience and develop their own techniques to conduct smooth parent meetings that are productive and painless. Experience dictates that the teacher prepare in advance for the meet, provide both positive and negative feedback judiciously, listen not only to the spoken word, but also the implications of parents, and be pleasant. With the inroads of technology into education, it is but logical that educators use technology to encourage meaningful parent participation and improve the experience for all concerned. Technology can enhance home-school communication in ways that alleviate communication challenges and barriers of time and distance that teachers and parents often face. There are many ways in which a teacher can use technology to improve the interaction, starting from scheduling to dissemination of student grade information, thus establishing avenues for parents to have a more meaningful role in education. (a) What is the nature of the message to be communicated? Is it a private communication about a specific student, or news/message dissemination to the parent community as a whole? (b) What are the types of technology that both teachers and parents have access to? (c) What are their skills and willingness of parents and teachers to use the technology, and to what extent? (d) Should technology replace face-to-face communication or will it complement offline communication? Some specific tools that the teacher can use to establish a fruitful parent-teacher-student triad partnership are as follows. Emails: Emails have replaced all conventional modes of communication in tech-savvy countries and are already used, especially in primary school, as a mode of communication between the teacher and students – announcements of assignments, submission of homework etc. have now already moved on in many schools to the digital classroom, to free the teacher of time, effort and paper clutter. 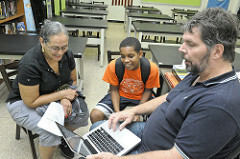 The use of email communication between the teacher and parent can help ease the strain during parent teacher meets because any issue, problem or announcement can be communicated at the required time without waiting for a later scheduled meeting so that the issue can be addressed immediately. This also frees the teacher from remembering and collating information and messages over the year to be conveyed to the parent. The parent also benefits from being in email touch with the teacher because she can monitor the progress of her child, and know of problems that the child may be facing academically and otherwise. It must however be remembered by all parties concerned that the line between “awareness” and “obsession” is blurry and both parent and teacher must take care not to overstep limits beyond which the freedom and privacy of the child is invaded. Apart from periodic email updates, weekly or fortnightly class newsletters could be created as a joint effort, to include examples of student work, and upcoming assignments. Such newsletters can be made a class assignment and include the syllabi in it, in terms of quizzes and creative assignments. Web Pages and Lists: The more tech-fervent teacher may create, or guide creation of a class webpage that provides information and updates on class activities as a whole. This could be a joint effort by the teacher and the students, and will serve not only the purpose of communication, but also a learning experience for the teacher and student. The students get to use, and display their creativity, in addition to learning hands-on practical skills such as web design, the teacher herself gets to know the hidden talents and skills of her students, and the parents get to know what happens in class, a win-win-win situation all around. Again, the possible pitfall here could be distraction – the focus could get shifted from learning a curriculum to learning the technology without careful monitoring and control, and the experience of the teacher can come handy here. Social Networking Tools: Social networking is a dicey tool that while allowing teacher to increase the level of communication using a recognizable social media format, possesses inherently a high risk of distraction. As a means for disseminating information and exhibiting and sharing the skills and talents of the students (through weblogs, for example), social networking can undoubtedly support the teacher-parent-student partnership. Mobile Apps: Mobile apps are increasingly gaining acceptance as a medium of communication between parents and teachers. Mobile apps such as Remind (formerly Remind101) and ClassDojo are being used by millions of teachers, parents and students, without doubt a staggering rate of adoption for apps that were launched but a couple of years ago. Video Conferencing and Video Podcasts: Occasional live video podcasts of class activities can make the parent feel more included in their child’s education. This can give the parent first-hand account of how the class is conducted, how the students behave and what improvements could be needed to make the class better. This particular use of technology in the classroom is, however, fraught with practical difficulties. On the technical end is the setting up of a video capture system and transmitting it to the parents, but the more difficult task is to obtain permission from all parents because of privacy issues. Even if such videos are shared only with class parents, there may be objections from the parents, and often even students themselves, which must be taken into consideration. Live Chats: The other side of video podcasts are live chats and video conferencing with parents. Video enhanced chat options are now aplenty and the parents and teachers can set up a convenient time to meet online to avoid schedule clashes and unnecessary travel. There are even free tools that allow live online collaborative sessions. Such tools allow multiple participants to communicate with one another to share ideas. Portal (or Apps) for Grades, Events and Calendar: This is perhaps the least “social” and most utilitarian part of technology in the area of parent-teacher interactions. Rather than wait a semester or year to share grade information to parents, such information can be sent to parents as and when required so that any followup discussions are more relevant and apt. Many schools already use student management. Technology allows parent-teacher interactions to be practical, positive and personal. Technology mediated communications tools such as videoconferencing, phone conferencing, online chats,and emails are already being discovered as efficient mediums to enhance school/home communication that allow teachers, parents, and students to stay connected and informed. Of course, there are occasions when teachers and parents must engage in a face-to face dialogue and online chat may not offer that level of “personal” touch and motivational spontaneity of a real-life interaction. Lack of computer access, and knowledge and skill in using technology and absence of interest in a new form of communication, by both teacher and parents, are some barriers to tech-enabled parent-teacher interactions. In such cases, a bare minimal use of technology must be encouraged that may include text-based and instant messaging and the use of tools that are more personalized to encourage active engagement.